Electronic ID cards should be a “badge of citizenship” and not an “obligation” says Lord Andrew Adonis. ID cards have been a controversial topic for many years, but Lord Adonis has reassured people that they would be a “better service” and not “intrusive” on people. Adonis has backed a call for electronic identity cards to come into action as a way of controlling immigration once the UK leaves the European Union. The report by the Global Future think tank, suggested Britain should introduce the cards to tighten controls on immigration, as Britain was the only nation within the EU not to have a national ID system. “Well, look the way we see this card actually working is it would bring together databases and cards which are currently issued anyway,” he said. “Let's be clear why this would be beneficial in this country… we have no means of knowing who is here legally and illegally,” he said. “If they've come from the EU - which I think is part of the concern that people had two years ago -every other country in the EU requires you to have ID registration. “If we knew who is in the country we could prevent illegal working. We could deal with other forms of illegality including people who are here for very dodgy purposes. 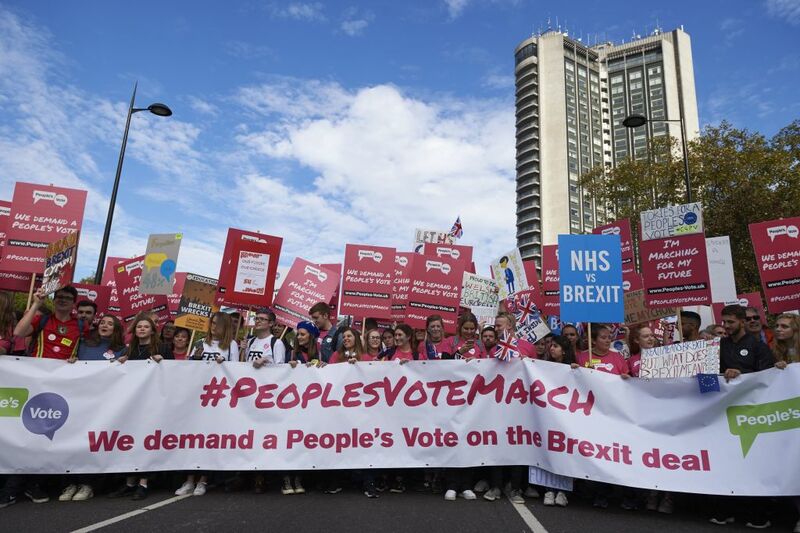 People's Vote march in London back in October. Lord Adonis has backed the call for a People’s Vote on the final Brexit agreement now that the withdrawal proposal has been published. He said it would be a “mistake” for Theresa May to “trash” our trade and jobs over immigration, as it is something that can still be sorted within the EU. “Well let's be clear what I'm saying there should be a people's vote,” he added. “So, they will have the say on whether we stay or leave the EU when they see the terms. “When somebody said to me but we voted on these two years ago and when people say this to me, I say well, what was it? Because the actual deal on which we saw for the first time last only came out on Wednesday - you know the 580 pages they've just been published. “What I'm trying to do is to deal with some of the issues that were raised two years ago. There were two big issues that were raised very clearly: One was austerity. People felt that austerity was bad and they wanted an end to that and they blamed the EU for that, but it is our government at home it should be blamed.